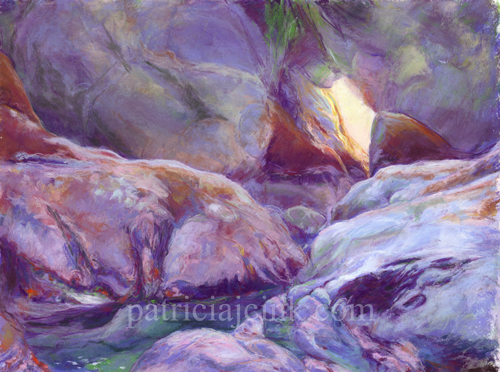 This painting was done from a reference photo taken on the same evening as my earlier painting, Secret Rock Garden. It is a fascinating place to explore and paint, different each time the ocean has a minus tide and permits visitors. In this view, the light streams through the hole in the massive rock to illuminate the tide pools and sea life covered rocks. I like how the tide pool points back to the window in the rock.